Upon your arrival at the Phuket Airport, meet and get escorted by our representative to one of our listed hotels. Relax in the hotel in the refreshing ambience of its room. One of the greatest advantages of being in Phuket is that there is always something of interest to engage in no matter what kind of weather it is. Phuket has a remarkable atmosphere and local life and one can enjoy an amazing time in the city. The rest of the day is free for your leisure where you can indulge in shopping or traveling around. Return and Stay Overnight at the hotel. After breakfast, proceed for the City Tour, to learn more about the local culture, history and ways of life of the people. Visit various Portuguese style buildings like Limpanon House etc., vibrant markets, Wat Chalong-the most important of the Buddhist Temples of Phuket, Rawai Beach, Sea Gypsy Village-an amazing beach and resort, away from the bustle of the urbanity and Cape Promthep-one of the most picturesque and photographed locations of Phuket. The evening is free for leisure. Spend the night at the hotel. Phi Phi Island is a mesmerizing place to visit. Post breakfast, get transferred to Phi Phi Island by a ferry. Upon your arrival at the Island, enjoy the same amazing view of the Maya Bay landscapes, which were featured in the blockbuster movie "The Beach". Have lunch at the beach and get taken away to the spot where you can indulge in various water sporting activities like snorkeling, surfing, swimming, etc. besides other adventure sports like windsurfing, parasailing and kite surfing etc. Return to your hotel in Phuket for the overnight stay. After having breakfast, check out of the hotel and get transferred to the Phuket airport to catch your flight to Bangkok. 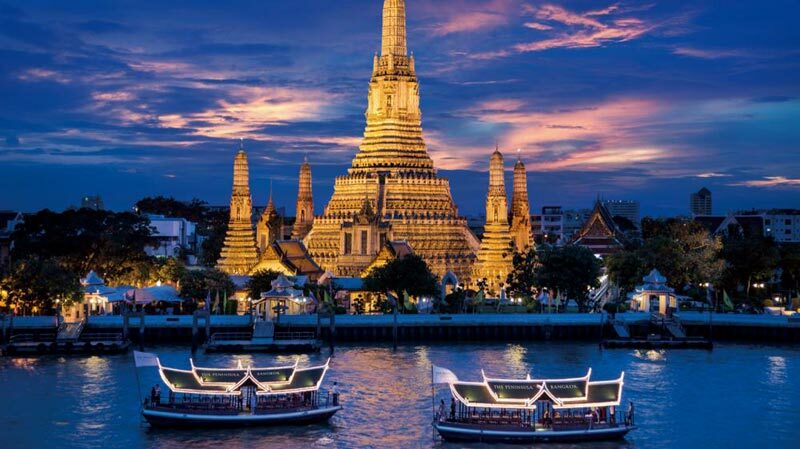 As you land at Bangkok, proceed for a Temple and City Tour of the city. Bangkok has a large number of temples and the city takes great pride in this fact. 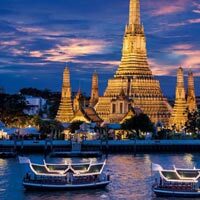 Two of the most prominent temples that Bangkok boasts of are-The Golden Buddha Temple and The Marble Buddha Temple, the latter a stunning structure of most exquisite architecture and one of most famous sites in the city. Return to your hotel in Bangkok for the overnight stay. Post breakfast, this day is free for leisure. You also have an option to spend your day at the exotic Safari World and Marine Park. Enjoy a day full of action exploring this wonderful wildlife park. Observe the flora and fauna and the other exotic variety of animal species from close by. After this, continue your adventure by proceeding to the Marine Park to revel in incredibly exciting shows like the Ski Dhow, Sea Lion Show, Dolphin Show as well as Elephant, Bird and Orangutan Show featuring the respective animals in a number of amazing activities and Hollywood cowboy stunt show etc. At sundown, return to you hotel for the overnight stay. This morning after breakfast, you will be transferred to the Bangkok International Airport for your journey back home.